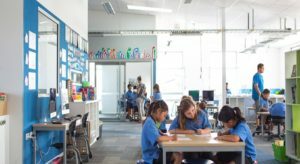 In this guest post Chris Bradbeer considers how we ensure that the school buildings we conceptualize today are still relevant in ten, twenty, or thirty year’s time, let alone fifty – given that requirements for learning, the needs of learners, and the concept of school itself are subject to continuing evolution? John Weeks, working in the field of healthcare architecture suggested in 1999 that architects must “design a building that will inhibit change of function least” (Weeks, cited in Abramson, 2016, p. 90). In essence, as Weeks notes, “buildings must be designed on the assumptions that, in the long run, the brief is wrong” (Weeks, cited in Abramson, 2016, p. 90). What he was referring to was tendency to design for the ‘now, and the immediately imagined possibilities’. How do we cater for the unimagined ones? I’m intrigued therefore by the idea of how as educators and architects we come to ensure the relevance of the schools and learning spaces we are engaged in designing, building and working in. By this I mean the relevance of the pedagogical approach and the built environment to one another, and also the relationship across time. The buildings we are designing for schools today are intended to be there for perhaps fifty to sixty years before replacement. Yet as we are often reminded, we are living in times of exponential change, particularly, according to Friedman (2017) in the contexts of technological, ecological and economic transformation. The question emanates from the common narrative at the centre of the pedagogy and space discourse – that many of our current school buildings have outlived their usefulness – constituting spaces that are ‘past their sell-by-date’, something perhaps exemplified in the statement from (Nair, 2011) that “the classroom has been obsolete for several decades” (Nair, 2011, p. 1). It is a relatively straightforward argument to make, if not accounting for teachers who have made the very best of what they have available, and have ensured that learning is relevant, engaging and challenging despite the space they have occupied. But it is something important to extrapolate forward from. How do we avoid it happening? Is it actually possible? To assist in understanding this I’ve turned to a couple of key references. 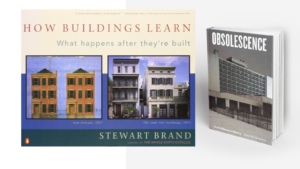 Stewart Brand’s How buildings learn: What happens after they’re built (1994), an inquiry into how buildings do, or don’t successfully adapt over time; and Abramson’s Obsolescence: An architectural history (2016), an investigation into the construct of architectural obsolescence, focusing on the tensions prevalent when intended usage is thwarted by lack of foresight or anticipation of changing requirements. How do we ensure learning and guard against obsolescence? Change and architecture are not always comfortable bedfellows, the first intimating fluidity, and the second solidity. For Brand (1994) buildings should be considered as not simply “whole in space, but whole in time” (, p. 3). In his view although many buildings are “designed not to adapt” (, p. 3) they do so anyway, “however poorly, because the usages in and around them are constantly changing” (, p. 3). He describes this as the way a building ‘learns’ over time. It’s a nice idea and a concept that transfers well to our field. As teachers we might describe ‘learning’ as building capacity in our students. How therefore might we ensure we build capacity in our environments to learn too? Some of the layers accept alteration more readily than others. Generally the less accessible the layer, the slower, more expensive, and less susceptible it is to change. More accessible means more changeable, but it could still be a process that still may take considerable time. 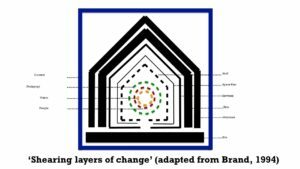 Changes, or the need to make changes, to one layer may well have a desired or undesired knock on effect to subsequent layers. Introduction of a new computer system for example – technology ‘stuff’, may well require alterations to the space plan, and then to the services, and so on. Similarly for example the desire for more sustainable energy solutions may begin with modification to the skin, then to the services, and into the space plan, and so on. Importantly Brand’s layers are associated with tangible physical artifacts. What are missing are layers of people and activities. In a school situation we might well add them – people (students and teachers), in the centre, and the pedagogical ‘activity’- taking place in relationship to the people and ‘stuff’ as an adjacent layer. Furthermore if we were true to Atkin’s (1996) principles of ‘designing from the inside out’ then we might place educational vision and belief at the very centre. Under this model too, we could also argue that we should incorporate the broader educational context and drivers, along with government policy, and global change. On the diagram, where might we place that? I’d suggest it goes on the outside. And I think by positioning it, it helps understand challenges faced by schools. Where schools run into problems is when the layers positioned between that vision and broader context preclude significant alteration. The buildings may well be perceived to lack the capacity for learning. So where do we need our schools to learn? As teachers we talk a lot about flexibility. Flexibility concerns itself with pedagogical functionality, activity occurring within one of Brand’s layers. It’s related to the ability and ease with which we can change ‘stuff’ around according to the activity we are engaged in. It’s the rearrangement of furniture through the course of a lesson, day or week to best meet the needs of learners and learning activity. Adaptability however acts over the longer term and is a function of sustainability. In Brand’s typology this is related to the ‘stuff’ but also requires changes to the ‘space plan’ layer too. This I’d argue is the layer we need to pay particular attention to in order to ensure relevance, and the layer that if we can gain more sophisticated understandings of, could help us respond to changing pedagogical needs over the next five, ten, twenty or even fifty years. Otherwise we risk obsolescence. Obsolescence, according to Abramson (2016) occurs when the need for change is outweighed by the buildings incapacity to do so, an apparent ”devaluation imposed upon architecture that is not intentionally short-lived, unfinished or lightweight” (, p. 5). When Nair explained that classrooms had become obsolete it was possibly with this in mind, and a perception that as a pedagogical setting they had had devaluation imposed upon them. One response to obsolescence is to take the building down and start again, another is to move and allow another activity that is less constrained by the layers to occupy the building. Abramson (2016) also offers a number of antidotes to obsolescence that have been applied across history, including examples of factory shed models of buildings where the “longevity of the structural shell would be maximised by its capacity for internal adaptability” (Abramson, 2016, p. 80); the idea of ‘externalised interstitialism’ that employs services arranged on the outside of buildings, most famously exemplified in Paris’ Pompidou Centre; as well as demountable components that could be taken down and moved to allow for extension, expansion, and adaptation over time. Abramson, D., M. (2016). Obsolescence: An architectural history. Chicago: The University of Chicago Press. Atkin, J. (1996). From values and beliefs about learning to principles and practice. Paper presented at the Seminar Series No. 54, Jolimont [Vic.]. Friedman, T. L. (2017). Thank you for being late: An optimist’s guide to thriving in the age of accelerations: Picador USA. Nair, P. (2011). The classroom is obsolete: It’s time for something new. Education Week.